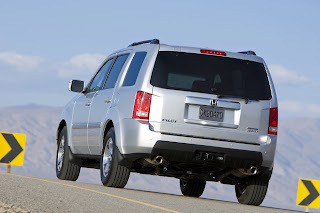 Honda USA has announced pricing for the 2010MY Pilot that sees no styling or equipment changes from the 2009 model that went on sale in the U.S last May. The 2010MY brings a price rise of $250 and $350, depending on the trim level. Available in both 2WD and 4WD forms and with 8 seats, the Pilot is powered by a 3.5 litre i-VTEC V6 petrol engine that produces 250bhp and 253 lbs-ft of peak torque. Prices for the 2010 Pilot start from $27,895 for the entry-level 2WD LX and top out at $38,645 for the 4WD Touring.